Life can change quickly. When Ashley Ascencio was twelve she saw someone she was close to spend time in jail. 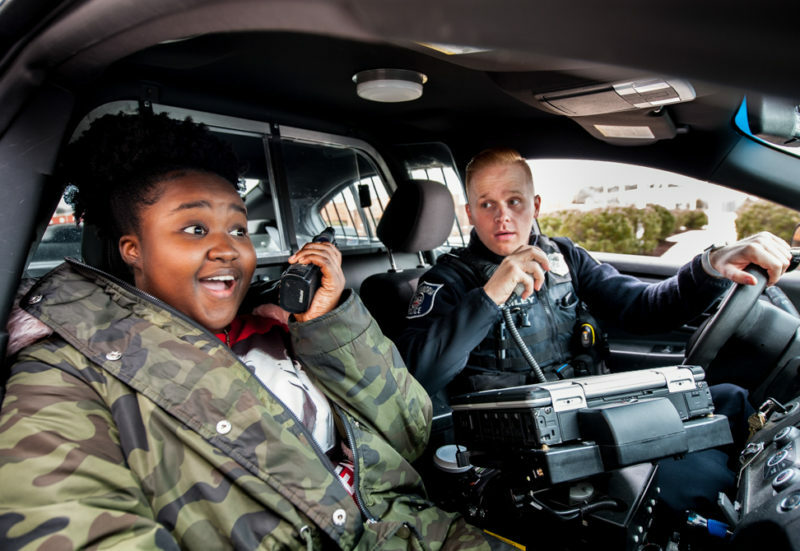 This fall, a ride in a police car as part of a criminal justice course sparked Ashley to join the Teen Law Enforcement Academy and make plans to study criminal justice in college with the goal of becoming a police officer herself. The ride put her in the front seat during traffic stops and gave her the chance to quiz an officer directly about why police do what they do. Students at T.C. Williams High School can take a ride-along as part of the criminal justice program. This fall, they have also been able to sign up for the Teen Law Enforcement Academy — run through the Alexandria Police Department — to get real insight into how the police operate. Both the criminal justice classes and the Teen Law Enforcement Academy offer students the chance to explore future career opportunities and help to build trust between youth and law enforcement. The two courses are among the more than 60 Career and Technical Education (CTE) courses offered at T.C. and in middle schools.